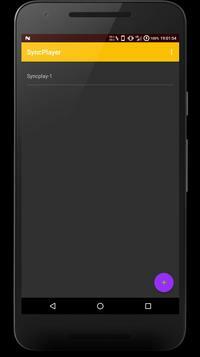 SyncPlayer is an unofficial open source Syncplay client for Android. It connects to Syncplay servers to sync video playback between two or more users. Use it to watch videos with your friends online. Just add a server, pick a video and make sure your friends join the same server and room. Please note: SyncPlayer does not stream or transmit the video data in any way whatsoever. It only synchronizes video playback between users. This is an unofficial project based on the open source Syncplay project. Please do not report any bugs regarding this app to www.syncplay.pl developers. Please report buggy behavior using feedback option on GitHub or send an email. Suggestions, feature requests all welcome.